The UC Irvine Police Department received a report of a male subject following a female UCI student onto an ASUCI shuttle and then to her on-campus apartment. The subject entered the female's residence without her consent and remained inside until she left. The subject also requested that the female hug him on several occasions and took photographs inside the victim's apartment. Approximately two weeks later, a male resembling this individual was seen staring into the victim's window from outside her apartment and then stood outside her front door for five minutes. If you have encountered or seen this individual on campus, please contact Detective Sergeant Anthony Frisbee at (949) 824-3398 or afrisbee@uci.edu. 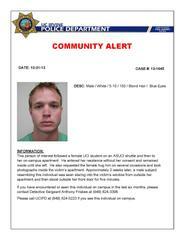 Please call the UC Irvine Police Department at (949) 824-5223 if you see this individual on campus. A photo of the subject can be found on the Police Department's website at: http://police.uci.edu/Person_of_Interest.pdf. Crime prevention safety tips, along with other personal safety information, can be found on the UC Irvine Police Department's website at www.police.uci.edu.